itslearning.com■Retail Price: Based on number of students and the services a district requires. 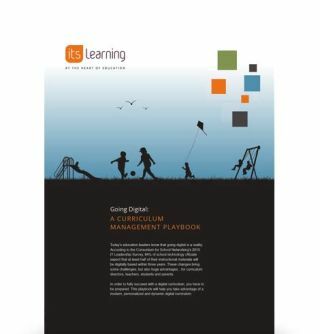 Itslearning is a cloud-based learning management system (LMS) for grades K–12. Quality and Effectiveness: itslearning meets a district’s need for one system to coordinate personalized learning. Each stakeholder has a single point of entry to this cloud-based LMS. Students, teachers, parents, and administrators log in on their own dashboards. Once connected, users can easily access the resources they need, including course content, a customizable standards-aligned planner, grades and assessments with rubrics, free and paid resources, and a variety of communication tools. Learning resources are all readily available and searchable—from those created within the district to those provided by partnerships with Gooru, Houghton Mifflin Harcourt, Office 365, OneDrive, Google Drive, Dropbox, and more. Ease of Use: itslearning employs a single dashboard where students find all of their courses, assignments, materials, assessments, and communications in one place. The system utilizes familiar communication sources like Twitter, Facebook, blogs, and discussions in a safe, controlled setting. Teachers find it easy to align curriculum to standards and use tools for tests, blogs, polls, video-conferencing, Web 2.0, and virtual field trips. itslearning also saves teacher time by setting up and collecting assignments, reporting grades, and presenting data in many different report templates. Since itslearning complies with the IMS Global Learning Consortium, the program can easily integrate with many content providers and mobile apps (e.g. iOS, Android). Creative Use of Technology: The planner in itslearning provides teachers with a quick and easy way to get an overview of students and their recent activity. Students can access feedback from teachers in any format they prefer (audio, video, or text) to best fit their learning styles. The parent portal allows parents to see all student work, activities, and assessments, and it also enables them to communicate with teachers and administrators. Since itslearning is cloud-based, all stakeholders can use the program at home and at school. Clear expectations for students can be communicated on student dashboards for use at home and school so there is less uncertainty about what is required of them. Flipped classroom activities and discussion boards concerning assignments can be done at home or at school. Suitability for Use in a School Environment: Because communication between all stakeholders (parents, students, teachers, and administrators) is readily available with itslearning, school learning communities can be created easily. For teachers, professional learning communities are a valuable addition—they can communicate with other staff members in their district and access PD as needed. The program’s automated grading and reporting features save time and make all information readily available to all stakeholders for planning and data decisions. With itslearning, digital content and data come together in each district. For students, e-Portfolio and personalization capabilities allow them to maintain an ongoing file of their work to share. itslearning also provides customer support and has created a support center with videos, user communities, and guides. Live chats and access to an extensive library of self-help materials are also available. Itslearning is an excellent, comprehensive, and user-friendly LMS for all district stakeholders. ●Single log-in so each stakeholder can access everything that is available to them. ● It’s simple to create individual learning plans using suggested resources with the automated content recommendation engine for remediation and review. ● Teachers can organize everything right on their dashboards to plan, assign lessons, assess, and communicate with students as well as with administrators, parents, and other teachers.